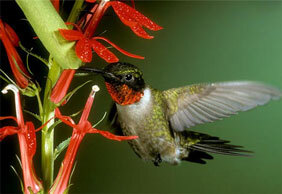 The Ruby Throated Hummingbird is a spring to summer resident in New Hanover and surrounding counties. 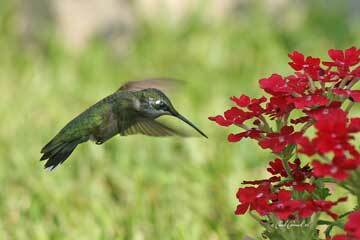 It is the only hummingbird that is commonly seen in this area (there have been sightings of rufous and black chinned hummingbirds, although these are extremely rare). You can identify these birds by their tiny size and feathers that shimmer in the sunlight. They have white bellies and green backs with darker tailfeathers that have white tips. Males can be distinguished from females and young birds by their bright red throat. It is common for this bird to be found in a variety of habitats and especially near flowers. They are particularly attracted to red flowers. 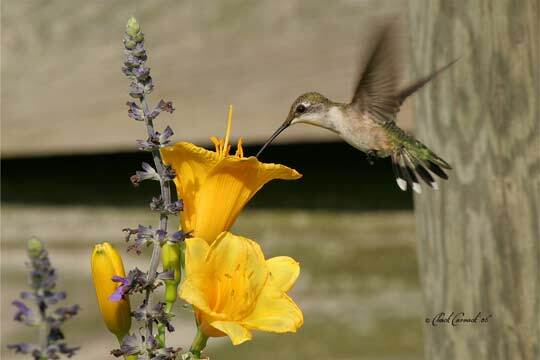 Another thing you can do to attract these birds is to put up a nectar feeder. At Wild Bird & Garden, we sell a variety of these, some of which are available online [link]. We also sell field-tested easy-to-mix nectar in powder or liquid form [link]. Come into our store to see our full inventory and variety of accessories!